The AGS-17 Plamya (Russian: Пламя; Flame) is a Soviet-designed automatic grenade launcher in service worldwide. The AGS-17 is a heavy infantry support weapon designed to operate from a tripod or mounted on an installation or vehicle. The AGS-17 fires 30 mm grenades in either direct or indirect fire to provide suppressive and lethal fire support against soft skinned or fortified targets. The weapon uses a blowback mechanism to sustain operation. Rounds are fired through a removable (to reduce barrel stress) rifled barrel. The standard metal ammunition drum contains 29 linked rounds. The tripod is equipped with fine levelling gear for indirect fire trajectories. Development of the AGS-17 (Avtomaticheskiy Granatomyot Stankovyi—Automatic Grenade launcher, Mounted) started in the USSR in 1965 by the OKB-16 design bureau (now known as the KBP Instrument Design Bureau, located in the city of Tula). Most probably its development was inspired by the Sino-Soviet border conflict of the late 1960s, as well as initial experience with several US automatic grenade launchers, learned from Vietnamese troops who were often on the receiving end of these weapons. It was thought that an automatic grenade launcher would be one of the most effective infantry support weapons against typical Chinese "human wave" attacks. This lightweight weapon was to provide infantry with close to medium range fire support against enemy personnel and unarmored targets, like trucks, half-tracks, jeeps and sandbag-protected machine-gun nests. The first prototypes of the new weapon entered trials in 1969, with mass production commencing in 1971. Never used against the Chinese, the AGS-17 was widely operated and well liked by Soviet troops in Afghanistan as a ground support weapon or as a vehicle weapon on improvised mounts installed on armored personnel carriers and trucks. At the same time, a special airborne version of the AGS-17 was developed for installation on Mi-24 Hind gunship helicopters. It is still in use with the Russian army as a direct fire support weapon for infantry troops; it is also installed in several vehicle mounts and turrets along with machine guns, guided rocket launchers and sighting equipment. A special airborne version, the AG-17A, was installed on the door mounts of several Mil Mi-8 Hip combat transport helicopters and on gun pods used in late model Mi-24 Hind gunships; this weapon had a thick aluminium jacket on the barrel and used a special mount and an electric remotely controlled trigger. It is being replaced by the AGS-30 launcher, (using the same ammunition, this weapon weighs only 16 kg unloaded on the tripod and has an upgraded blowback action). AGS-17A-remotely controlled aircraft mounted version with electric trigger mechanism. AGS-17D-remotely controlled vehicle mounted version with electric trigger mechanism. Ukrainian company Precision Systems developed a miniaturized handheld version of AGS-17 called RGSh-30 "in order to create a grenade launcher that could respond to the needs of Ukrainian units and special forces operating in the Donbass". RGSh-30 is designed to disable armored vehicles. that can be carried like an assault rifle. 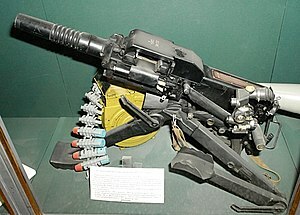 RGSh-30 uses magazines with five 30mm VOG-17 grenades. Precision Systems plans to develop versions using 20mm, 25mm, and 40mm grenades. The AGS-17 fires 30×29 mm belted cartridges with a steel cartridge case. Two types of ammunition are commonly fired from the AGS-17. The VOG-17M is the version of the original 30 mm grenade ammunition, which is currently available and has a basic high explosive fragmentation warhead. The VOG-30 is similar, but contains a better explosive filling and an enhanced fragmentation design that greatly increases the effective blast radius. New improved VOG-30D grenade was taken into service in 2013 for use with AGS-17 and AGS-30 grenade launchers. The Bulgarian weapons manufacturer Arcus produces AR-ROG hand grenades based on VOG-17 cartridges and UZRGM (Russian: УЗРГМ), which is also a Soviet design of fuse. China – produced by Norinco based on captured examples from Mujahideen groups. Serbia – designated the M93 Produced under license. AGS‑40 Balkan, second successor using caseless high-explosive 40mm 7P39 grenades. Koll, Christian (2009). Soviet Cannon: A Comprehensive Study of Soviet Arms and Ammunition in Calibres 12.7mm to 57mm. Austria: Koll. p. 239. ISBN 978-3-200-01445-9. ^ a b c "AGS-17 en Afghanistan". Encyclopédie des armes : Les forces armées du monde (in French). IX. Atlas. 1986. pp. 2017–2019. ^ de Tessières 2012, p. 74. ^ a b Gramizzi, Claudio; Tubiana, Jérôme (March 2013). New war, old enemies: Conflict dynamics in South Kordofan (PDF). HSBA Working Paper 29. Small Arms Survey. p. 34. ISBN 978-2-9700856-2-1. ^ "Syrie: comment al-Qaïda reprend pied en zone djihadiste". France Soir (in French). 28 June 2018. ^ "AGS-17 Automatic Grenade Launcher". www.military-today.com. Military Today. ^ "AGS-17". modernfirearms.net. Modern Firearms. ^ "Arcus AR-ROG defensive hand grenade (Bulgaria), Grenades - Hand". Retrieved 23 November 2014. ^ a b c d e f g h i j k l m n Jones, Richard D. Jane's Infantry Weapons 2009/2010. Jane's Information Group; 35 edition (January 27, 2009). ISBN 978-0-7106-2869-5. ^ a b "A new generation of AGLs: within only a few decades the Automatic Grenade Launcher (AGL) has leapt from the concept stage to becoming a widely accepted and valued infantry support weapon, providing the foot soldier with a highly effective area fire suppression system". Retrieved 23 November 2014. ^ "Armament of the Georgian Army". Archived from the original on 9 March 2012. Retrieved 23 November 2014. ^ "Mourir pour le califat 116/« En vérité, ils seront noyés »-Wilayat al-Raqqa" (in French). 27 September 2017. ^ de Tessières, Savannah (April 2012). Enquête nationale sur les armes légères et de petit calibre en Côte d'Ivoire: les défis du contrôle des armes et de la lutte contre la violence armée avant la crise post-électorale (PDF) (Report). Special Report No. 14 (in French). UNDP, Commission Nationale de Lutte contre la Prolifération et la Circulation Illicite des Armes Légères et de Petit Calibre and Small Arms Survey. p. 97. ^ US Department of Defense. "AGS-17 AUTOMATIC GRENADE LAUNCHER". North Korea Country Handbook 1997, Appendix A: Equipment Recognition (PDF). p. A-89. ^ Small Arms Survey (2008). "Light Weapons: Products, Producers, and Proliferation" (PDF). Small Arms Survey 2008: Risk and Resilience. Cambridge University Press. p. 24. ISBN 978-0-521-88040-4. ^ На границе Джобара и Замальки | At the border of Jobar and Zamalka. 16 January 2014. Retrieved 8 February 2014. ^ "Vcvikov tde v Prpore vcviku Martin". Retrieved 23 November 2014.